Here you can find a strain description about Blue Headwreck and also some user-based reviews and infos directly from the SeedFinder (if available). You can also find the offers and auctions here if Blue Headwreck cannabis seeds are on stock at MyCannapot right now. Blue Headwreck (Blueberry OG Wreck x Blue Headband) is a stable Indica dominant F2 hybrid strain. 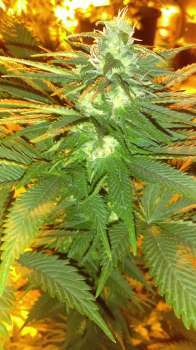 There are a few different phenos, mostly all leaning toward indica. Like her mother, Blueberry OG Wreck, she is a heavy yielder indoors or outdoors and she produces very dense, very frosty buds with a fruity, piney, earthy aroma (the aroma varies between the different phenos). Blue Headwreck is very good meds for chronic pain, stress, PTSD and depression. Also helps with suffering from fibromyalgia and PMS. Flowering period is 8-9 week to finish. Buy Blue Headwreck now at MyCannapot! There are no actual running auctions for Blue Headwreck right now.